Your one-stop-guide for traveling, eating, and living the authentic Peru experience. We are here to provide you with quality content written by travel experts, travel gurus, travel influencers, expats, nationals, you name it, that inspires you and gives you the tips and information you need when planning your travels (long or short-term) to Peru. 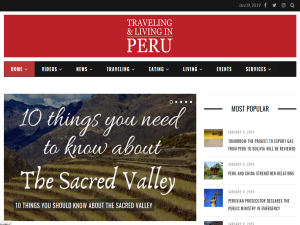 This what your Traveling & Living in Peru Blog Ad will look like to visitors! Of course you will want to use keywords and ad targeting to get the most out of your ad campaign! So purchase an ad space today before there all gone! If you are the owner of Traveling & Living in Peru, or someone who enjoys this blog why not upgrade it to a Featured Listing or Permanent Listing?